Preheat oven to 180ºC (350ºF). Place the butter and sugar in the bowl of an electric mixer and beat until pale and creamy. Add the vanilla and egg yolk and beat well to combine. Add the flour and beat until a smooth dough forms. Divide the dough into 4 equal portions and wrap in plastic wrap. Place in the refrigerator for 15 minutes or until the dough is firm. Roll the dough out between 2 sheets of non-stick baking paper until 5mm-thick. 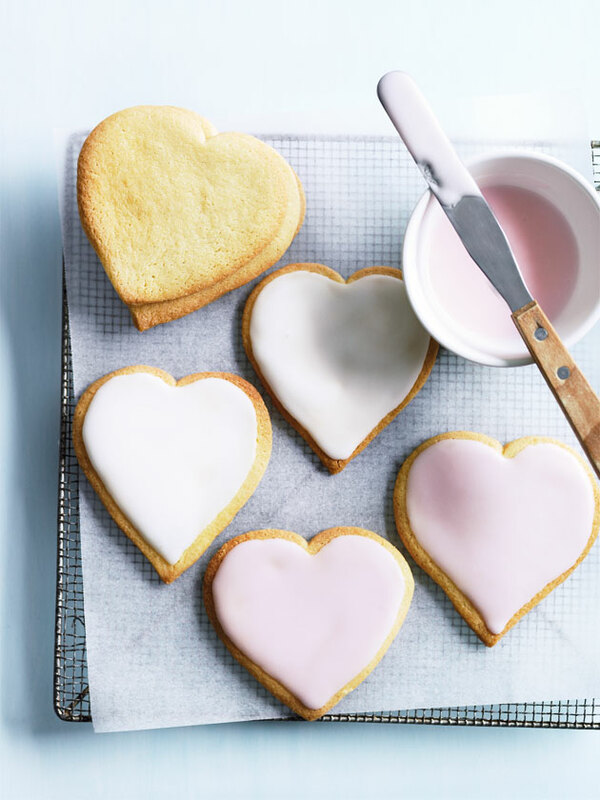 Use a 9cm heart-shaped cookie cutter to cut 16 hearts from each pastry sheet. Place the cookies on baking trays lined with non-stick baking paper and bake for 8–10 minutes or until light golden. Allow to cool on wire racks. Place the icing sugar and water in a small bowl and mix to combine. Spread half the cookies with the icing. Place a few drops of food colouring into the remaining icing and mix until well combined. Spread the remaining cookies with the pink icing. Makes 16.